Richard Harrington was born in Hillsboro, Oregon and moved to Western NY when he was sixteen. 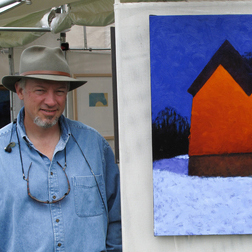 He graduated from SUNY Geneseo in 1982, majoring in business and studio. It wasn’t until his apprenticeship with Richard Beale that he knew he would be a painter. He is strongly influenced by nature and his surrounding environments. Harrington paints in his studio from sketches that he has done in the field. He lives and works in South Lima, NY.